Starting in Philadelphia in 1920, three generations of Foschi’s have been in business with studios in New Jersey and Delaware. Since then, Foschi has been a name synonymous with quality portraits for both the casual style in our garden studio or the formal style in our extra large camera room. We specialize in creating heirloom images for your home that will enhance your living room or any room in your home. The Foschi Studio specializes in photographing families, engagement portraits, weddings, children, business portraits, bunny photography, or any special celebration. Our goal is to capture beautiful images while having fun. 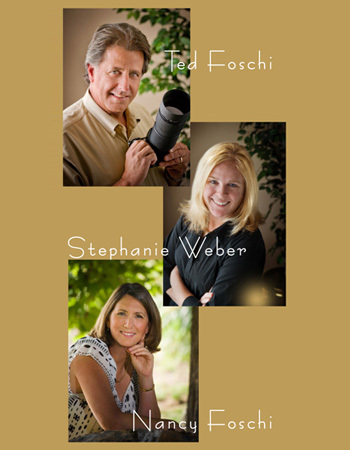 Ted Foschi is a third generation portrait photographer. After earning his degree from RIT he opened a successful portrait and wedding studio. Along with his team of talented people, Ted takes pride in creating beautiful images that you will treasure forever. Ted is a member of Professional Photographers of America and Professional Photographers of Delaware. Stephanie Weber is a highly skilled wedding photographer. She has managed the studio wedding division for many years. She creates a personal relationship with our wedding clients helping them to choose the package and photographer that will be right for them. Nancy Foschi is an integral part of the Foschi Studio. Nancy covers almost all studio positions. She is our main marketing and sales representative. People who meet her know she is a great listener and problem solver.